Chandeliers come in various styles such as crystal, polished brass, and hand-forged wrought iron. It can enhance any room within any style genre. You will also have the option of choosing transitional, traditional, rustic and contemporary chandeliers with either sleek finishes or clean lines. We can help you find the right size, materials, and color, and it will suit the style and décor of your home. Did you know you can choose from mini-chandeliers for smaller rooms such as bedrooms, bathrooms and even foyers or hallways? You get the luxury of a dining room chandelier, without the size! 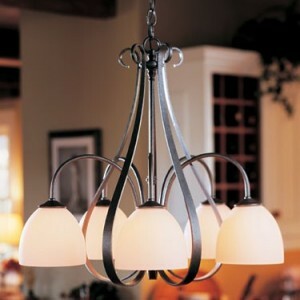 One example is our “Hubbardton Forge Wrought Iron Sweeping Taper” three light- three candle cluster chandelier. It will work in any setting, and it combines quality with traditional style. If you’re looking for a chandelier that will give your dining room varied levels of light, then you can choose a small one. It will work well above your dining room table or other areas. For example, our “Hubbardton Forge 3 light Flora” chandelier, which is a popular design. It has flowing accents with beautiful glass bulbs, and it will add a nice touch to all your family gatherings. Your dining room chandelier will enhance the look of your room, and it can become the centrepiece of your home too. For example, you will like our Hubbardton Forge “Double cirque -large scale Chandelier”. It is round in shape, and it has metal petals to create a floral pendant, which will give your room a feminine touch. The steel on this pendant is mixed into gentle swirls and curls to go around the light, which creates a glow and unique ambiance. Whether you’re looking for a chandelier as a focal point, or something more subtle, we can help you find one that you will be impressed with. We have various styles and brands including Seagull, H.A. Framburg and Holtkoetter, and we have styles such as lodge-type chandeliers, rustic, and contemporary chandeliers. Furthermore, we have Asian-inspired chandeliers as well as polished brass chandeliers. It is important, however, to pick a chandelier that is the perfect size, and one that will complement any space. That is why we have skilled professionals who can educate you on any chandelier including the color, materials and size in order for you to pick the perfect chandelier for your home. Dining room chandeliers are versatile, and you can find one regardless of how high the ceiling is in your dining room, the size of your dining room, and the configuration. Please take a look at our website ( www.crescentharbor.com ) today to see what styles are available.